The telephone and radio were two of the greatest inventions of the late 19th century. During the 20th century, they came together in a third great invention: the cellular (mobile) telephone. Cellular phone use has grown rapidly since the device was developed in the 1970s; roughly one billion mobile handsets are not in use worldwide. Although many individuals contributed to the development of cell phones, American inventor Martin Cooper is usually credited with making the handheld cell phone a reality. When Martin Cooper was born on December 26, 1928, the modem electronic tools that we now take for granted-personal computers, color televisions, pocket calculators, and compact-disc players-had yet to be invented. "It's really embarrassing," he recalled later, "The television did not become commercial until I was past my teen years." Growing up in Chicago, Cooper-like many children did in those days-entertained himself by reading books, especially science fiction. At that time the most exciting new technology was radio. People called it "wireless" and thought of it mostly in connection with radio programs and, later, with television (because radio waves are also used to transmit the images seen on a television screen). Few people had any idea that radio had other uses. Cooper believed, however, that radio was the future. After earning a degree in electrical engineering at the Illinois Institute of Technology, he served in the navy during World War II, and then joined the research department of a telecommunications company. The road to cellular phones began with Alexander Graham Bell’s invention of the telephone in 1876. Around the same time, scientists were discovering how radio waves could send information through the air without using wires. The first person to transmit human speech by radio waves was American engineer Reginald Fessenden (1866-1932). On December 24, 1906, Fessenden used radio to send a spoken message 11 miles from Brant Rock, Massachusetts, to ships in the Atlantic Ocean. The first truly mobile phones, called radiotelephones, appeared by the 1940s; they were cumbersome radio sets carried around in emergency vehicles and taxis. In 1946, AT&T and Southwestern Bell introduced MIS (Mobile Telephone System), a commercial radio system that used five antennas and a central switching office to transmit conversations between moving vehicles. The following year, AT&T introduced long-distance radiotelephone service between New York City and Boston. These early systems were so popular that they had waiting lists of up to 10 years to buy them. They were limited in that they could transmit only a few telephone calls simultaneously. Early radiotelephones sent and received calls on a narrow section of radio-wave frequencies known as a band. This was like a pipe of limited diameter through which only a certain number of calls could squeeze at a time. Clearly many people wanted radiotelephones; in response, the Federal Communications Commission (a U.S. government body that regulates telecommunications) agreed to make more frequencies available if telephone companies could find a more efficient way to use them. Two companies, AT&T Bell Labs and Motorola, took up the challenge. In the late 1960s, Bell Labs developed a system (Metroliner) that enabled public pay telephones on trains to send and receive calls by radio. Motorola, where Martin Cooper had been working since 1954, was developing a completely mobile phone. At Motorola, Cooper had led a team of scientists who developed walkie-talkie radios, used for the first time by the Chicago police department in 1967. Cooper's walkie-talkies were comparatively simple, because only a limited number of radios were in use at once. Developing a hill-scale radio telephone system was trickier. What was needed was a way of allowing many different telephones to use the same hand of radio frequencies but to keep the different calls from interfering with each other. Cooper solved this problem by using a system called “cells,” which had been invented by Bell Labs in the 1960s. The idea was to place radio antennas all around a city in a honeycomb pattern. Each antenna would serve only the small area, or cell, immediately around it, not the entire city. Neighboring cells could use the same radio frequencies, so as the number of antennas and cells increased, the number of telephones that could be used at the same time would increase also. 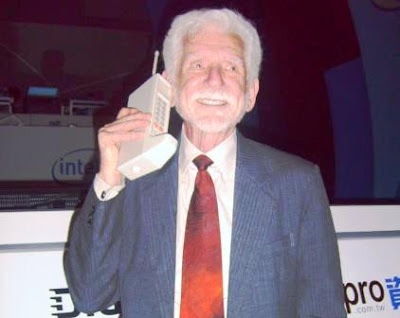 Motorola's first cell phone was the shape and size of a brick and weighed 28 pounds (12.7 kg). However, Cooper's team soon took advantage of new microelectronic technology to build a smaller device, the DynaTAC, which weighed only 2.8 pounds (1.27 kg). On April 3, 1973, Cooper walked through the streets of New York City to demonstrate the new phone. He decided to test it one last time and, on the spur of the moment, called his rival at Bell Labs, an engineer named Joel Engel, to boast of his achievement. Of this, the world's first cell phone conversation, Cooper said later, "I don't remember my precise words. 1 do remember a kind of embarrassed silence at the other end." The patent for a "radio telephone system" was granted to Martin Cooper and seven of his Motorola colleagues on September 16, 1975. Telephones had caused a revolution at the end of the 19th century; mobile cell phones caused a similar stir some hundred years later. By the early 1980s, Cooper's team at Motorola was running a large-scale test service in Washington, D.C., and Baltimore, Maryland. DynaTAC, the world's first commercial handheld cellular phone, finally went on sale in 1984. This first-generation system weighed 28 ounces (793 g) and cost $3,995, and the battery had a one-hour life. Technology advanced greatly during the 1980s. In Europe, 26 telephone manufacturers got together and launched a joint cell phone system known as GSM (Global System for Mobile Telecommunications). It used digital technology: calls were transmitted not as raw sounds but as coded strings of numbers. This enabled many more telephone calls to be handled. It offered other advantages, too: digital phone calls had better sound quality, had greater protection from eavesdropping, and could send and receive short written messages (known as SMS or text messages). In the United States, the PCS (Personal Communications Services) system worked in a similar way. These systems came to be known as second-generation networks. In the 21st century, mobile networks are faster, the handsets are smaller, and all kinds of information (from photos to Web pages) can be sent to and from a cell phone. Many developing countries are abandoning land-lines entirely; residents use wireless cell phone networks for both their telephone and their Internet access. Several decades after making the world's first cell phone call, Martin Cooper is still too busy to retire: "Think about what the alternative is," he told one reporter. "You could sit around talking about the past and boring people to death, or you can keep active and be where the action is." In 2006 he was the chairman of his fifth start-up company, ArrayCom, which develops advanced cell phone networks.